Live Action News has previously documented how taxpayers in several states are footing the bill to pay for abortions, even repeat or multiple abortions. A newly-enacted law in Illinois provides state health insurance and Medicaid coverage for abortions, and the media is salivating to cheer it on. But tragically, rather than direct women to resources which can help them with options other than abortion, many in the media are glorifying the use of taxpayer dollars for abortions as the best solution for pregnant women in need. We can’t deny the fact that women can face many struggles during pregnancy, which the profitable abortion industry can exploit. After all, the abortion industry knows that repeat abortions occur more frequently when they are taxpayer-funded. A survey conducted by the Guttmacher Institute, Planned Parenthood‘s former “special affiliate,” revealed that taxpayer-funded abortions were a factor for women who had at least one prior abortion. The researchers found that “[p]atients who paid for their abortion procedure with their own funds were less likely to have had a prior abortion than those who used health insurance or received financial assistance.” A later Live Action News report, which found that the number of women in New York who had not experienced a previous abortion was smaller than the number of those funded by Medicaid, confirmed this. 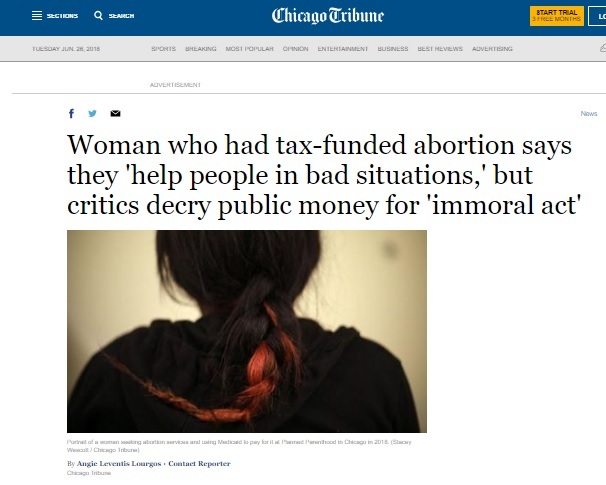 In this case, the abortion patient admitted to the Tribune that she already had one young child, and painted a picture of hardship, which she claims led her to have two abortions — the most recent one funded by taxpayers. That procedure reportedly was obtained at a publicly funded hospital at a discounted rate. This time, the woman claimed, she wanted to be sedated during the abortion, and she turned to Planned Parenthood who was all too willing to help. After all, it was taxpayer funds that would be used for this. So, rather than offering a discount to the woman experiencing financial hardship a discount — or better yet, assistance with her housing, job needs, or food — Planned Parenthood arranged a $500 Medicaid-funded abortion procedure, which the woman accepted. Abortion is far from a solution to this woman’s problems, and by promoting Planned Parenthood, rather than life affirming organizations, the media is partly to blame for why some women feel abortion is the best solution. It is indeed a tragedy when women are made to feel that surrendering their child to the abortionist’s knife is their best or only option. Even more tragic is the fact that instead of highlighting how easy it is to obtain a taxpayer-funded abortion, Chicago Tribune reporter Angie Leventis Lourgos chose not to provide a list of places that offer pregnant women help, such as charities, churches, and pregnancy resource centers. Planned Parenthood’s services are decreasing, while taxpayer funding and abortion market share have increased. Planned Parenthood is covering-up child sexual abuse. Planned Parenthood has been been cited for overbilling abuses and Medicaid fraud. Planned Parenthood has been cited for privacy violations, including some allegations at Planned Parenthood of Illinois (mentioned in the Chicago Tribune story). Members of the media routinely fail to tell unsuspecting women about Planned Parenthood’s medical emergencies, including the death of an abortion patient at — you guessed it — an Illinois Planned Parenthood facility. The doctor in that case, Mandy Gittler, is listed as an independent contractor in Planned Parenthood of Illinois’ most recent 990 (see below). But, hey, why should the Chicago Tribune mention that? Instead of offering women real choices, Planned Parenthood and its friends seek to squelch the free speech of pro-life pregnancy centers which offer life affirming solutions. Thankfully, however, a recent Supreme Court ruling has thwarted that effort, at least for now. As for the woman featured by the Chicago Tribune, how, exactly, has abortion improved her situation? Did it make her a better mother? Did it suddenly make her more financially stable? According to the report, nothing changed for that woman except that she will now live with the truth that she has participated in the deaths of two of her children. Abortion, regardless of who funds it, offers women death, and nothing more.